At the roadshow, check out the exclusive Hello Kitty Mazda 2 Hatchback - the Grand Prize for the Hello Kitty Contest ongoing until March 2013. 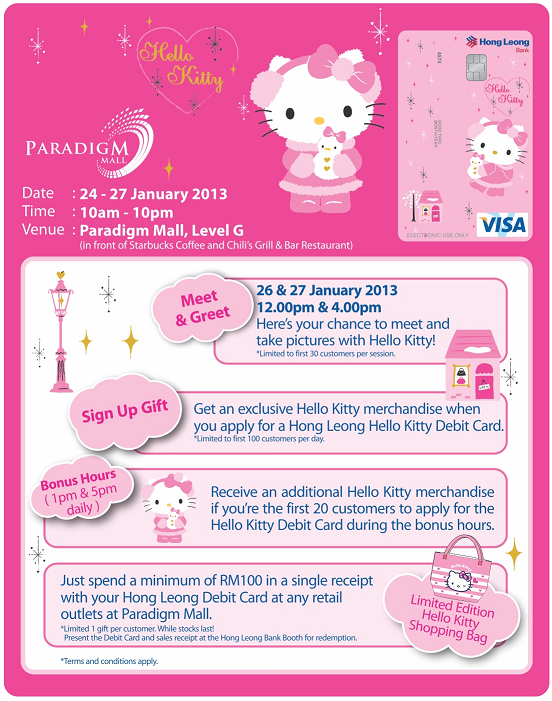 When you sign up for your Hello Kitty Debit Card, you will also receive limited edition Hello Kitty merchandise while shoppers will receive Hello Kitty merchandise when they pay using their Hong Leong Bank debit cards, while stocks last! i tell u i tell u, i have a guy friend has this in his wallet! i was like: WTF?! and he said: it's so special i decided to get one for myself. @. @" i am still feeling shocked now.. huhu..
and he is not gay.